The Vrtba Garden (Vrtbovská zahrada) in Lesser Town dates back to the beginning of the 18th century. 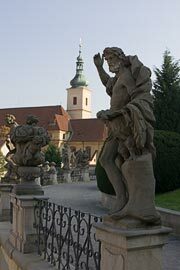 This Italian-style terraced Baroque garden is a quiet oasis in the center of the city and one of the most beautiful gardens in Prague. The best time to visit is in the spring and summer when the flowers are in bloom. The Vrtba Garden is an architectonically unique complex of precisely designed flower beds and large staircases that are adorned with statues of ancient Roman gods and goddesses. The fact that the garden lies on a slope makes it attractive for yet another reason - the exquisite view of Lesser Town from the viepoint on the top of the garden. The Vrtbovská zahrada underwent eight years of restorations in the 1990s and was opened to the public in 1998. The opening times and admission listed below are subject to change. Please check vrtbovska.cz for current information.